Al-Qahtani Aviation, owner of SaudiGulf Airlines, has signed an agreement to purchase ten A320neo family aircraft. 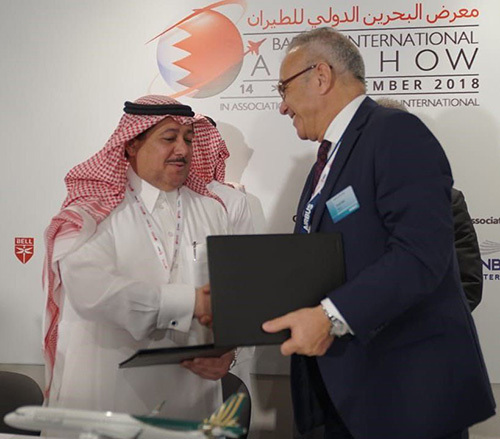 The commitment was announced at last week’s Bahrain International Airshow (BIAS), which concluded on 16th November 2018. SaudiGulf Airlines currently operates a fleet of six A320 aircraft from its hub in Dammam. The carrier commenced operations in 2016 serving domestic destinations across the Kingdom prior to expanding to international routes. In October, 2018 the airline launched its second international destination with flights to four destinations in Pakistan. “The A320neo family represents a natural evolution of our current fleet of A320 aircraft and will contribute significantly to our network expansion in the region as well as internationally,” added Samer Majali, President & Chief Executive Officer of SaudiGulf Airlines. This order will be complemented with additional A320neo aircraft from the leasing market,” he continued. “We are honored to expand our partnership with SaudiGulf Airlines, as we are adding more A320s to our customer’s all Airbus fleet,” said Christian Scherer, Airbus Chief Commercial Officer. “The A320neo family, with its lower operating cost, greater fuel efficiency and superior passenger comfort, will surely support SaudiGulf Airlines to achieve its ambitious growth plans,” he added. Airbus is a global leader in aeronautics, space and related services. In 2017 it generated revenues of €59 billion restated for IFRS 15 and employed a workforce of around 129,000. Airbus offers the most comprehensive range of passenger airliners from 100 to more than 600 seats.